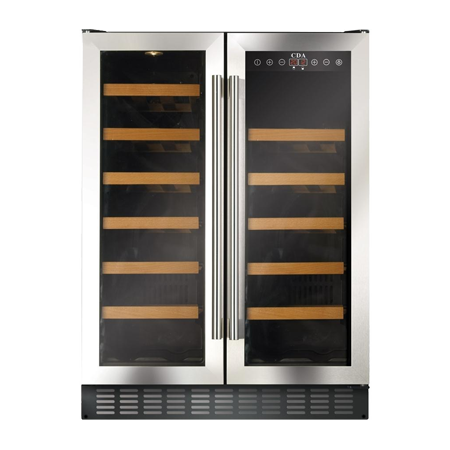 Keep up to 40 bottles of wine at the perfect temperature in this CDA fwc623ss Wine Cooler..
With its dual storage zones, the fwc623ss Wine Cooler can offer ideal environments for both your red and white wines, allowing you to serve them at the ideal temperature for real drinking satisfaction. Use its electronic temperature controls to easily maintain optimum conditions for wine storage. With two humidifiers, the wine cooler is able to stop the bottle corks from drying out, so your wine will stay in top condition for longer. The CDA fwc623ss Wine Cooler uses a compressor system that minimizes vibrations that can easily affect fine wines, keeping the sediment from the maturation process stably. It also helps the fridge to run quietly. With UV protected, smoked, toughened glass, the wine cooler stops direct sunlight from harming your wine, so you can proudly display your collection without unexpected surprises upon uncorking. A digital display lets you monitor temperatures directly and set the conditions for each zone, with an alarm to let you know when levels have changed or become unstable. Theres also a temperature memory function to store inputted temperatures, so you wont have to re-input information should there be a power cut. Enjoy a correctly-set temperature at all times. Choose the CDA fwc623ss Wine Cooler for large, flexible storage of your favourite drink.